CELADA looks forward to meeting and building partnerships with its fellow members! Karl Nerenberg, the pianist/convenor of the jazz-and-other-music group “Stay-Tuned / Restez-à-l’écoute” will be playing jazz, soul and 1960s pop at Jambo Restaurant on Wednesday, April 25th, from 7:30PM to 9:30PM. We encourage you to join us as this event will offer CELADA an avenue to raise awareness about our cause, as well as funds for activities in the coming months. Jambo Restaurant is an African restaurant located on 69 Kempster Avenue in Ottawa. The cuisine is inspired by the traditional foods of Eastern and Central Africa. Hear from the board on our new membership to the International Land Coalition, some recent and upcoming events and our overall strategy in moving CELADA forward. Join CELADA for dinner and a screening of “Dead Donkeys Fear No Hyenas” on March 13th. This is an eye-opening film that explores the worldwide commercial rush for farmland and its impacts on people’s lives in the context of Ethiopia—a country experiencing one of the most massive forced evictions in modern history. The film examines Ethiopia’s contradiction as a nation known for chronic food aid dependence while earning billions of dollars from the export of food and other agricultural products. 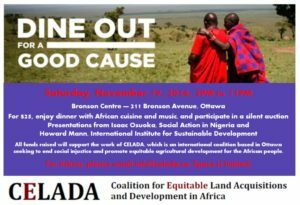 Proceeds will support the work of CELADA, an international coalition based in Ottawa seeking to end social injustice and promote equitable agricultural development for the African people. Experts report that while women in Africa contribute 70 per cent of food production, they often lack rights to land. As a result, donors like Canada, have been encouraged to consider and address land-related issues in their development policy, programme and research initiatives given their critical role in women’s empowerment. UN agencies such as FAO and UN Women are also working with non-governmental organizations to raise awareness among women of their rights and to support efforts to entrench equality of access in national laws. 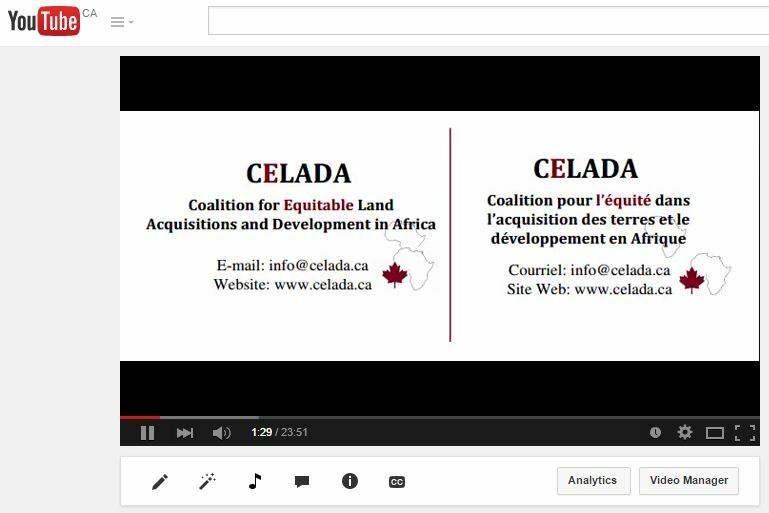 Join CELADA on March 27th from 9:30AM to 11:30AM on the UOttawa campus for a panel presentation, featuring Dr. Ward Anseeuw from the International Land Coalition (ILC) in Rome, that will offer greater insight on how gender-sensitive land policies have translated to real progress for women’s land rights in Africa. Panelists will also debate what is needed to increase women’s security of access to land and what role Canada as a donor plays in that regard. ***While Mike Taylor was originally chosen as the keynote speaker for this event, due to unforeseen circumstances, he can no longer travel to Ottawa. That said, he has asked his colleague at the ILC, Ward Anseeuw, to speak in his place. Ward is an expert in African land policy issues and we feel fortunate in having him as our keynote. Earlier this year, the Minister of International Development announced a public review and consultations to renew Canada’s international assistance policy and funding framework. The new framework is intended to help refocus Canada’s international assistance on helping the poorest and most vulnerable people, and supporting fragile states. It will also determine Canada’s approach internationally to supporting the 2030 Agenda on Sustainable Development. An initial discussion paper that was developed by Global Affairs to stimulate consultations clearly noted access to water as an important cross-cutting theme, while access to land was conspicuously absent. In an effort to raise the prominence and consideration of land rights within this review, CELADA submitted a proposal that highlighted the critical need to protect land rights, equitable access to land and tenure security for vulnerable populations. We invite you to join us for a fundraising soirée, filled with African cuisine and music, a silent auction and presentations from Isaac Osuoka from Social Action in Nigeria, Felix Horne from Human Rights Watch, and Howard Mann from the International Institute for Sustainable Development. All funds raised will help provide the resources needed to expand our current activities and develop important new ones. If you have any questions about purchasing your ticket, please contact Eshete Hailu at (613) 400-1599. If you would like to advertise the event through your networks, please feel free to download and use our event flyer, and/or use the eventbrite link. GRAIN recently released a comprehensive and compelling account of the horrendous treatment and human rights abuses of multiple communities in the DRC in a 100 year-old land rights struggle with foreign agribusiness investors. According to GRAIN’s report “Agro-colonialism in the Congo: European and US development finance bankrolls a new round of agro-colonialism in the DRC”, in 2009 a Canadian agribusiness company, Feronia Inc., bought up land previously controlled by Unilever in the DRC. Unilever had chosen to abandon its palm oil plantations on this land — which its predecessor, Lever brothers, had acquired under colonial rule — due to an ongoing war in eastern Congo. 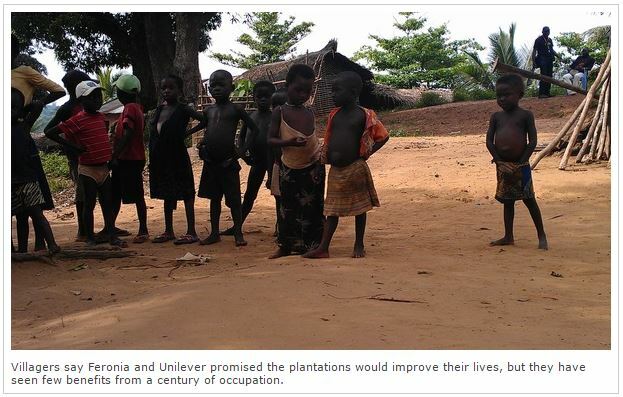 The legacy of social injustices that Unilever left behind (read section of report titled “Unilever’s Role” for a horrific and detailed account) has persisted and expanded under Feronia’s ownership, which now carries the support and financial backing of multiple powerful development finance institutions (DFI). Many of the DFI’s involved in Feronia’s dealings have policies and standards meant to prevent their investment in companies/projects with human rights and social injustice issues. Their investment in Feronia Inc. therefore calls into question the effectiveness of private sector regulation, and draws attention the need for better governance of international land deals at the international, regional and national levels.